If I had to sum up The Twelve Lives of Samuel Hawley by Hannah Tinti it would be it's about a man who lost his way. 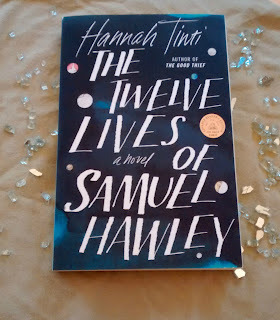 I won The Twelve Lives of Samuel Hawley in a Goodreads giveaway. When it arrived I couldn't remember what had attracted me to the book, but then I started to see it everywhere. It seemed to be the book everyone was talking about. Have you read it? From the back cover: After fifteen years on the run, Samuel Hawley moves with his teenage daughter, Loo, to Olympus, Massachusetts. There, is his late wife's hometown, Hawley finds work as a fisherman, while Loo struggles to fit in at school and grows curious about her mother's mysterious death. Haunting them both are the twelve scars Hawley carries on his bodies, from twelve bullets in his criminal past -- a past that eventually spills over into his daughter's present, until together they must face a reckoning yet to come. This father-daughter epic weaves back and forth through time and across Amerca, from Alaska to the Adirondacks. Both a coming-of -age and a literary thriller. 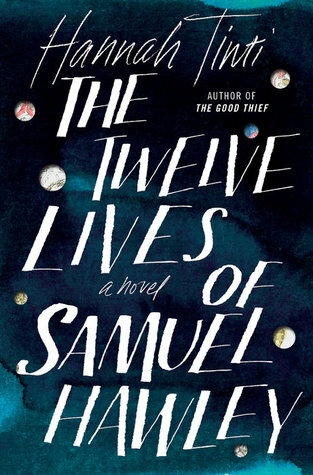 The Twelves Lifes of Samuel Hawley explores what it means to be a hero, and the cost we pay to protect the people we love most. I really enjoyed the coming-of-age story of Loo. She is an interesting character as she leaves childhood behind and on the verge of adulthood. She has had a chaotic childhood as her father moves her from one place to another. Do they move because Hawley's past is coming after them, or is it because someone is asking too many questions and will possibly uncover his past? When the book begins, Loo is your typical tween that has been raised by a single dad. She is pretty unkempt, though there's no real indication that she is neglected. More along the lines of unbrushed hair, disheveled clothing. She's moved around a lot, and for many children that would lead to them falling behind in school. But not Loo. When she and Hawley do eventually settle down, she skips a grade. I mostly kept reading to find out what happens to Loo. The other reason I kept reading was Tinti's writing. She has crafted a wonderful story. This was my first novel by her and I was impressed. I will be looking for future books from her. I didn't care too much for the flashbacks to Hawley's past, though as they came closer to the present I found them more interesting, or maybe they just grew on me. Each flashback is based on one of Hawley's scars and how he got it. I was left with one question throughout - how did he never get caught? His presumably best friend, probably mentor Jove did a couple of stints in jail, but there is never any indication that Hawley was picked up for any of his crimes. I started seeing where the ending was going a few chapters before it happened. But that didn't stop the ending from being satisfying. I really liked how the story came full circle in the end. When I turned the last page, my only thought was "Samuel Hawley is a man who lost his way." Which isn't really an original thought as Hawley had mentioned losing and finding his way throughout the novel. But for me, I wasn't so sure if he lost his way when he started his life of crime or when he went straight. I may not have remembered what drew me to the book in the first place, I'm glad that I did notice it. While this wouldn't typically be the kind of book you would think of as a 'beach read', this would make for a good vacation read. And they do live on the coast.